The 4-post hydraulic press gives your machine extended functionality. Designed to be the workhorse for your business, it lets you accept a wide variety of jobs, knowing you can get them through the shop with precision and speed. When you choose the 4-post hydraulic press made by the experts at RK Machinery, you add flexibility to your shop. You get the advantages of a flatbed tooling process in addition to the other applications you commonly need. With a 4-post press, you get a machine that offers a cutting-edge method for ram travel. It uses 4 chromed rods that have been specially designed to streamline the process. Concerned about frame flex issues? Our 4-post hydraulic press removes the problem through innovative design. And you will no longer have to deal with difficulties related to platen parallelism. We know how they can compromise the manufacturing process. This design also saves you money by reducing the chances of damage to costly materials. It improves the efficiency of your work cycle so the job goes through with accuracy and without delay. The 4-post press makes shop life easier, especially when it comes to all types of flatbed tooling. Regulating pressure is simpler, more precise and thus safer for the operator. The stroke control is easy to modify. It also has job mode, which can streamline a number of processes. You and your operators benefit from the design innovations behind our 4-post press. You know all the parts are superior quality and made to endure for years of demanding operation. You get a machine that keeps workers safe and speeds production. Every job in your shop has its own individual requirements. You need the proper tools and machine functionality to get the job out correctly, efficiently and on time. That’s exactly what you get with our 4-post hydraulic press. Power is produced by a Baldor motor, giving you up to 50 tons of pressure for a wide variety of applications. With platen tables that are interchangeable, you can rely on the 4-post press for flexibility. Whatever the specific machining and tooling capabilities that your customers’ jobs demand, you can depend on the 4-post and our other presses to get the job done right. Here at RK Machinery, we have been helping machine shops just like yours since 1980. That’s almost four decades of service, providing the highest quality hydraulic presses and accessories to shops all over North America. We are proud of our reputation for safe, sturdy, long-lasting presses. Using the latest technology, we deliver equipment that boosts efficiency, adapts to a wide range of job requirements, and produces precise deliverables day after day. If you need a part, you won’t have to worry about extended downtime. Parts are quickly available all over North America. No need to wait for a component to arrive from overseas. 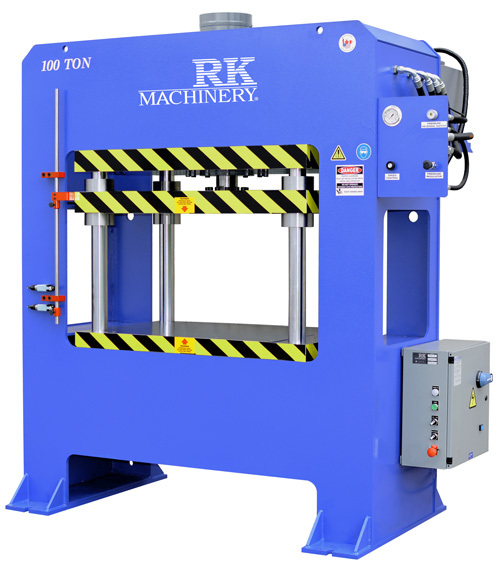 Call RK Machinery today to find out how the 4-post hydraulic press can improve production in your shop.